Even if the recent Eurozone recovery has reduced the need for monetary stimulus, ECB officials are adamant that quantitative easing remains on the table. President Mario Draghi also recently reiterated a need to target price stability, hinting at his readiness to fight deflation at all costs. This saw the shared currency continue its slump against the dollar for the third straight session, ending 42 points lower at $1.3740. With business sentiment in Germany, Europe's biggest economy, coming in weaker than expected, market participants realised that QE remains on the table for the ECB. 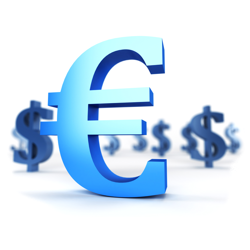 As such, they pushed the euro 42 points lower against the dollar to $1.3784, acknowledging that the recovery on this side of the Atlantic is still in its infancy. A larger than estimated slump for German Ifo business confidence sparked a fall in the shared currency against the dollar in the early session. Nonetheless, a speech in Paris by the ECB President Mario Draghi about monetary policy remaining accommodative brought buyers back into the forex market and the euro pared most of the losses, ending just 13 points in the red at $1.3825. Participants in the currency market are getting hopeful that the conflict between Russia and Ukraine might not escalate into military action, especially when Ukrainian troops in Crimea were ordered to retreat. As such, demand for the shared currency increased, with the EUR/USD pair rallying 45 points to $1.3840, gains which were held overnight ahead of this morning's sentiment data. As Federal Reserve signalled its intention to raise interest rates sooner than initially predicted, it came as no surprise to see a rally in the dollar. On Friday, the euro interrupted that, rebounding 15 points to $1.3793 but it could be more of a dead cat bounce, especially if US economic data remains strong and global geopolitical tensions increase demand for a safe haven currency.